IMGT/mAb-DB is part of IMGT®, the international ImMunoGeneTics information system®, the high-quality integrated information system specialized in immunoglobulins (IG), T cell receptors (TR), major histocompatibility complex (MHC) of human and other vertebrates species, immunoglobulin superfamily (IgSF), MHC superfamily (MhcSF) and related proteins of the immune system (RPI) of vertebrates and invertebrates species, created in 1989 by Marie-Paule Lefranc (Laboratoire d'ImmunoGénétique Moléculaire, LIGM, Université Montpellier 2 and CNRS) and on the Web since July 1995. IMGT/mAb-DB is the IMGT® monoclonal antibodies (mAb) database. In 2008, amino acid sequences of monoclonal antibodies (IG, mAb) and fusion proteins for immune applications (FPIA) from INN/WHO were entered in IMGT/2Dstructure-DB, a section of IMGT/3Dstructure-DB. The IMGT/mAb-DB Query page allows five types of search Search by. It also allows to select fields to be displayed in the results Displayed Fields. IMGT/mAb-DB ID which has been defined in order to identify the IMGT/mAb-DB entries by numeric code. IMGT/mAb-DB General Query allows you to make requests on multiple fields (Currently : INN Name, common name, proprietary name, IG format, PMID, author name, publication title), even with just a part of the information. INN (International Nonproprietary Name) provided by WHO/INN (World Health Organization). The search by INN is case insensitive . A selection on INN is also possible in a drop-down list. INN proposed list as published by WHO/INN. 'and before' and 'and after': allows a search of mAb published before a proposed (or recommended) list. INN recommended list as published by WHO/INN. Common name includes name found in the literature. The search by Common name is case insensitive. Proprietary name includes antibody registered trademark, usually identified by symbol ™ (not yet registered) and ® (registered). The search by Proprietary name is case insensitive. IG or immunoglobulin or antibody, complete or partial (Fab, Fab', scFv). An IG (or antibody fragment) must contain at least one variable domain (for example VH) to be designated with the suffix (stem) '-mab' in INN. IG can be radiolabelled, fused or conjugated for diagnostic or therapeutic purpose. IG class or subclass (for complete IG); e.g. IgG1 kappa, IgG1 lambda, etc. IG format (for IG fragments or constructs); e.g., Fab, scFv, scFv-scFv, VH-VH, etc. FPIA (Fusion proteins for immune applications). FPIA result generally from the fusion of one or several region and/or domain of protein(s) with the Fc of an IG in a '(protein)2:Fc' format. The Fc is used for its effector properties. They are currently designated with the suffix (stem) '-cept' in INN. CPCA (Composite proteins for clinical applications). CPCA identify genetically engineered proteins other than FPIA that result from the fusion of peptide, region and/or domain of protein(s) of different sources, or from the fusion of peptide, region and/or domain of protein(s) to a chemical or biochemical agent. The Fc may be present and used as a transporter or to increase the product half-life but, not for its effector properties that are rather avoided. CPCA do not have a special suffix (stem) in INN but are designated by a name related to their mode of action (MOA) or biological property. RPI (Related proteins of the immune system). RPI comprise the proteins of the immunoglobulin superfamily (IgSF) other than IG and TR, the proteins of the major histocompatibility superfamily (MhSF) other than MH, cytokines and their receptors, integrins, proteins of the scavenger receptor superfamily (SrSF) and any protein found in vivo that is, directly or indirectly, involved in the immune response. none: entries without a know IMGT receptor type. If the button "none" is checked, drop-down lists (for IG, FPIA and RPI) are reset. FPIA (Fusion proteins for immune applications) and CPCA (Composite proteins for clinical applications) correspond to in vitro engineered proteins of the WHO/INN programme. These categories FPIA and CPCA will be proposed for the INN definition in publication lists. Murine: A murine antibody is one of which both chain types are of mouse origin. A murine antibody is identified by the pre-stem -o- in its INN. Rat: A rat antibody is one of which both chain types are of rat origin. A rat antibody is identified by the pre-stem -a- in its INN. Chimeric: A chimeric antibody is one of which both chain types are chimeric as a result of antibody engineering. A chimeric chain is a chain that contains a foreign variable domain (V-D-J-REGION) (originating from one species other than human, or synthetic) linked to a constant region (C-REGION) of human origin. A chimeric antibody is identified by the pre-stem -xi- in its INN. Humanized: A humanized antibody is one of which both chain types are humanized as a result of antibody engineering. A humanized chain is a chain in which the complementarity determining regions (CDR) of the variable domains are foreign (originating from one species other than human, or synthetic) whereas the remaining chain is of human origin. By extension an antibody is described as humanized if more recent protocoles were used for the humanization. A humanized antibody is identified by the pre-stem -zu- in its INN. Human: A human antibody is one of which both chain types, and the J chain in the case of polymeric antibodies, are of human origin. A human antibody is identified by the pre-stem -u- in its INN. Note that, in the case of polymeric antibodies, the INN is only based on the immunoglobulin chain origin. Hybrid: A hybrid antibody is one in which one-half of the antibody (one heavy chain and one light chain) is from one species origin whereas the other half is from another species origin. An hybrid antibody is identified by a INN pre-stem made of each species pre-stem separated by the letter 'x' in the INN. For example, a rat-murine hybrid antibody is identified by the pre-stem -axo-. Entries in IMGT/2Dstructure-DB allows to retrieve mAb and FPIA that have an entry in IMGT/2Dstructure-DB. Entries in IMGT/3Dstructure-DB allows to retrieve mAb and FPIA that have an entry in IMGT/3Dstructure-DB. Origin clone species: allows the selection on mAb clones of a single parent cell. Origin clone name: the search by clone is case insensitive. Specificity target name: A bispecific antibody is an antibody with two different variable domain binding sites (Fv), each binding to a different antigen. By keeping the "shift" key pressed, it's possible to select several specificity. Phase I: safety testing and pharmaceutical profiling in humans. In Phase I clinical trials, researchers test a new drug or treatment in a small group of people (20-80) for the first time to evaluate its safety, determine a safe dosage range, and identify side effects. Phase II: effectiveness in humans (dose-ranging studies in target population). In Phase II clinical trials, the study drug or treatment is given to a larger group of people (100-300) to see if it is effective and to further evaluate its safety. Phase III: extensive clinical trial in humans (late-stage clinical trials in humans). In Phase III studies, the study drug or treatment is given to large groups of people (1,000-3,000) to confirm its effectiveness, monitor side effects, compare it to commonly used treatments, and collect information that will allow the drug or treatment to be used safely. Phase M: on the market. Phase IV: trials complete; regulatory application filed. In Phase IV studies, the post marketing studies delineate additional information including the drug's risks, benefits, and optimal use. These phases are defined by the FDA (Food and Drug Administration) in the Code of Federal Regulations. "Orphan" status: In the U.S., the designation "orphan" status applies to a disease that affects fewer than 200,000 people. In the E.U., the designation "orphan" status defines drugs for rare conditions that affect not more than five in 10,000 people. AMM: Autorisation de mise sur le marché (Market authorization). EMA: European Medicines Agency for the Evaluation of Medical Products. FDA: Food and Drug Administration. Antibodies and FPIA receiving approval by FDA but subsequently withdrawn from the market are not included in the result list. sBLA: Supplemental Biologics License Application. 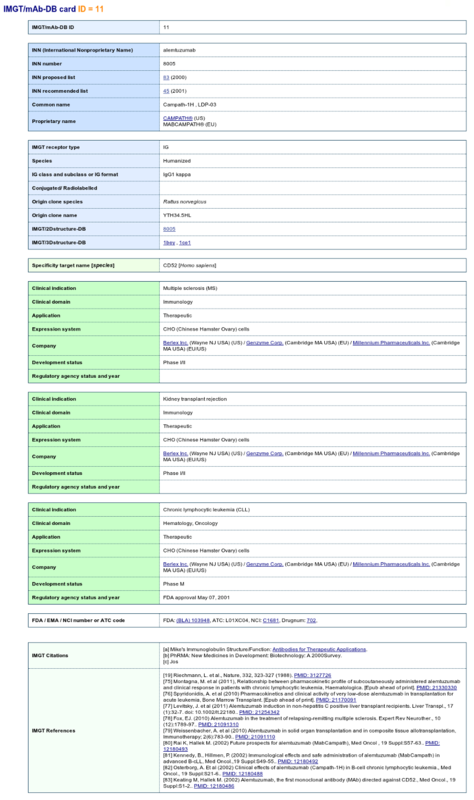 DailyMed: DailyMed database entries related to mAbs. A query on Regulatory agency, without other fields, will all now products approved (not included the withdrawn ones). Company: propose a search on mAb creation and engineering company. Companies for one clinical indication are classed in a group and separated by "/". The search is case insensitive. Expression system: the expression system includes vectors that contains the entire human genomic constant region of a immunoglobulin heavy and/or light chain and is adaptable for insertion, without mutagenesis, of a nonhuman antibody variable region. The resulting expression vector includes the entire human genomic constant region and the entire nonhuman variable region lacking tissue specific promoter and/or enhancer regions normally associated with genomic DNA. The search is case insensitive. Application includes diagnostic and therapeutic. Allows to select fields to be displayed in the result of the query. 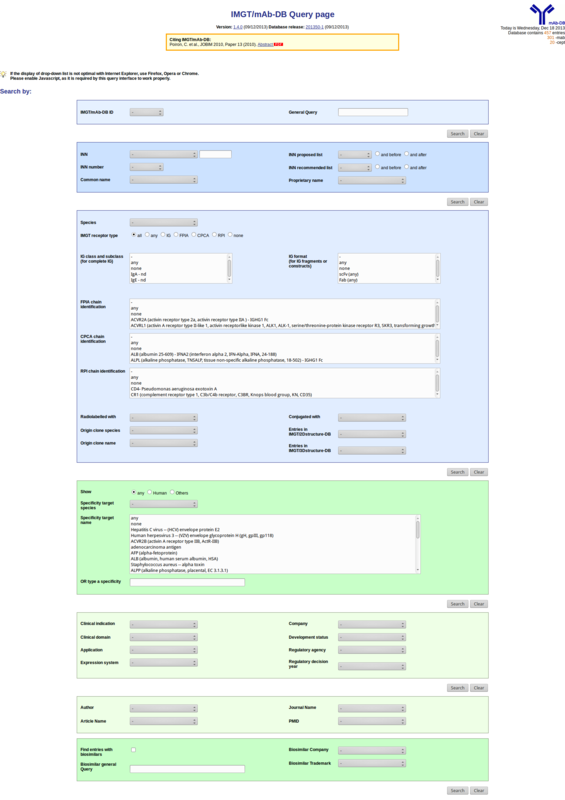 Selecting criteria may force the display of corresponding fields. Immunotoxin: IG, RPI or FPIA linked with a toxin. Immunotoxins can be queried in Section 3 'Conjugated'. Examples of toxins in IMGT/mAb-DB: Pseudomonas aeruginosa exotoxin A or Staphyloccocus aureus enterotoxin A.
Immunoadhesin: FPIA constituted of binding domain(s) (usually from a receptor, ligand, or cell-adhesion molecule) linked to immunoglobulin constant domains (Fc regions). An immunoadhesin is identified by the suffix -cept in its INN. Immunoadhesins can be queried in Section 2 'INN name' using 'cept'. Immunoconjugate: IG, RPI or FPIA conjugated with another molecule (toxin, antibiotic, chelator, enzyme...). Immunoconjugate can be queried in Section 3 'Conjugated'. Original applications are generally submitted for new products including at FDA new uses of food and color additives or for new food labeling claims. IND: Investigational new drug application --for drugs and biologics. NDA: New drug application --human drug. PLA: Product license application --biologics. ELA: Establishment license application --biologics. BLA: Biologics license application --combines PLA and ELA for biologics. PMA: Premarket application --medical device. NADA: New animal drug application. The result presentation depends on the displayed fields chose at the IMGT/mAb-DB Query page. On top of each result page, the query are recalled and the number of results is shown. Each displayed field corresponds to a title of column in result table. The blue arrows reorders the result by the selected column. 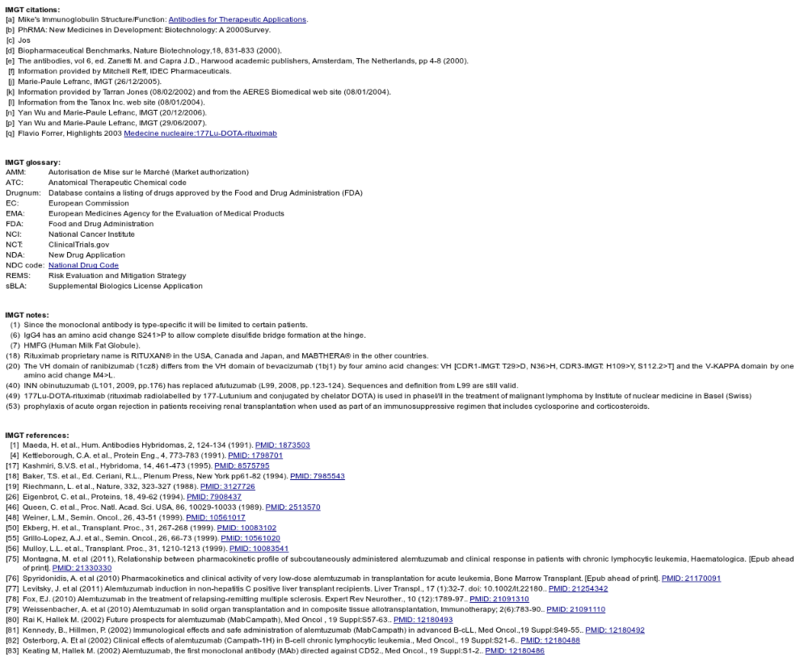 At the bottom of every page, the references, notes and citations of every entry are available. To get access to the IMGT/mAb-DB card, click in the IMGT/mAb-DB result page on the IMGT/mAb-DB Id (first column on the result). Minor changes in individual card. Internal code and database changes. Recover missing section in individual card. Corrected small errors in the handling of biosimilars and clinical trials. Add of the Clinical studies column. Add of the development technology column. Add of the biosimilar column. Upgrade of Query Page: addition of IMGT/Receptor type CPCA (Composite protein for clinical application). Upgrade of Query Page and Documentation. Addition of hyper-links to Risk Evaluation and Mitigation Strategy (REMS) and list of clinical trials (NCT). Upgrade of Query page: it's possible to query multiple IG class and subclass, or/and IG format, or/and FPIA chain identification, or/and RPI chain identification in the same search. IMGT/mAb-DB has been upgraded with new functionality: a IMGT/mAb-DB card. Upgrade of Query page: it's possible to query multiple specificity in the same search. Options available to search by IMGT/mAb-DB ID or IMGT/mAb-DB receptor type (IG and FPIA). Warning: Database update is now a continuous process. The WHO/INN proposed list 110 is now available. The WHO/INN proposed list 109 is now available. IMGT/mAb-DB now offers information Clinical Trials of the monoclonal antibodies. The general query can now be used for PMIDs, authors and publication titles. IMGT/mAb-DB now offers information about Biosimilars and Development Technology of the monoclonal antibodies. Update entries for ID: 388 and 331. Upgrade with INN proposed list 106 : Addition of 8 mAb and 1 CPCA (INN) in IMGT/mAb-DB. Upgrade with INN recommended list 67 : Upgrade of 13 mAb and 2 cept (INN) in IMGT/mAb-DB. Addition of 8 CPCA (INN) in IMGT/mAb-DB. Upgrade of 33 mabs (INN) with specificity target name and species. Addition of 13 -mab and 2 -cept in IMGT/mAb-DB. Upgrade with INN Recommended list 66. Upgrade of species (NCBI taxonomy). Addition of 16 -mab and upgrade of 2 -mab in IMGT/mAb-DB. Upgrade with INN Recommended list 65. Addition of 10 -mab and upgrade of 3 -mab in IMGT/mAb-DB. Add of IMGT/Receptor type RPI (related protein of the immune system). Upgrade of 13 -mab and 1 -cept in IMGT/mAb-DB. World Health Organization (WHO) International Nonproprietary Names (INN) Programme. International Nonproprietary Names (INN) for biological and biotechnological substances (a review). WHO/EMP/RHT/TSN/2014.1 (2014) 81 pages. World Health Organization (WHO) International Nonproprietary Names (INN) Programme. International Nonproprietary Names (INN) for biological and biotechnological substances (a review). INN Working Document 05.179. Update 2013 (2013) 74 pages. World Health Organization (WHO) Programme on International Nonproprietary Names (INN). International Nonproprietary Names (INN) for biological and biotechnological substances (a review). INN Working Document 05.179. Update 2012 (2012) 65 pages. World Health Organization (WHO) Programme on International Nonproprietary Names (INN). International Nonproprietary Names (INN) for biological and biotechnological substances (a review). INN Working Document 05.179. Update 2011 (2011) 62 pages. World Health Organization (WHO) Programme on International Nonproprietary Names (INN). International Nonproprietary Names (INN) for biological and biotechnological substances (a review). INN Working Document 05.179. Update December 2010 (2010) 60 pages. Quality Assurances and Safety of Medicines. International Nonproprietary Names. Nomenclature for monoclonal antibodies. WHO Drug Information 23(3): 195-199 (2009). World Health Organization (WHO) Programme on International Nonproprietary Names (INN). Guidelines on the use of International Nonproprietary Names (INNs) for pharmaceutical substances. WHO/PHARM S/NOM 1570 (1997) 40 pages.